The Fisherman's Feast is a street festival that takes place in Boston's North End District. The North End has been the predominately Italian-American neighborhood in Boston for more than 110 years. The basis of the feast is religious in nature—a Catholic tribute to the Virgin Mary with its roots originating in the ancient town of Sciacca in Sicily. Areas in the North End are blocked-off from vehicular traffic, and a street festival takes place. Vendors line the streets and offer products and entertainment such as Italian foods, carnival-style games, children's amusements, marching bands, and several small concert stages with different performers. The grand finale of the Feast is a religious procession through the narrow streets with men carrying a statue of Mary, draped with ribbons of currency, until they reach a Catholic church located in North Square. The donated funds are presented to the church as a tribute. The Madonna del Soccorso di Sciacca Society sponsors the event, and was founded in 1910. In recent decades the Fisherman's Feast has greatly expanded, and has become a tourist attraction. Many people that originally grew up in the city return each year to celebrate the 100 plus year old tradition. What was essentially a large block party 40 years ago, draws nearly 100,000 people in attendance today. The Feast begins with a blessing of the waters on Thursday, and ends on Sunday with the statue of Madonna meeting a statue of Saint Rosalia at Sacred Heart Church at North Square. The most poignant moment is the traditional Flight of the Angel. A young girl is lowered from a window or rooftop via pulley down to the Madonna Statue, and offers her a bouquet of flowers. Food is the main attraction of the Fisherman's Feast. There are vendors selling everything from sausages to quahogs and cherrystones (hard shell clams). Pizza, ice cream, gelato, and Italian pastries such as canolies are offered by vendors and the local bakeries and restaurants in the neighborhood. There will also be fried dough and Italian Ice of course. If you aren't hungry when you arrive downtown, you will be as soon as you smell the aroma of the many foods cooking as you approach the North End. The religious aspect of the Fisherman's Feast dates back to the year 1300 when an Augustinian Monk saw a vision of Mary, who told him she would help the people of Sciacca, and to spread this message. In 1503, a large statue of Madonna could not be transported via land from Palermo to Sciacca, and was carried by sea. Since that time, the festival in Sciacca was associated with fishermen, and they are the only people allowed to carry the statue during their procession. The Sciacca festival takes place in February, while in the North End it takes place in August, about the same time as the Feast of the Assumption, that celebrates Mary's ascension into Heaven. At the end of the Fisherman's Feast, the statue of Madonna del Soccorso (Our Lady of Help) is carried through the streets and brought to Sacred Heart Church, her home during the year. A statue of Saint Rosalia is carried to the front door, and they meet. Members of the Society then lead the crowd in shouting "Viva Madonna del Soccorso" and "Viva Saint Rosalia." Saint Rosalia is credited with helping to end a plague of cholera that struck Palermo in the 16th Century. Of historic interest, Sacred Heart Church in the North End stands at the location where Father Taylor's Bethel (Chapel) stood. 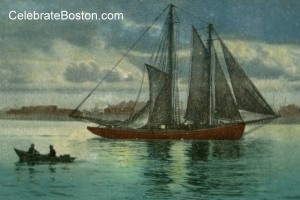 He was known as the Preacher Sailor, and dedicated his life to spreading the gospel to the sailors of Boston, having been a sailor himself at a young age. Being a fisherman is a difficult occupation, with many temptations after returning to port, and Father Taylor was known for his brilliant oration to guide and inspire the fishermen. The Methodist bethel operated there from 1833 to 1873. Saint Anthony's Feast, another popular food festival, normally takes place the week after the Fisherman's Feast.